To get your private licence from a zero hours starting point you would need to spend about two weeks with us in Alice Springs. During this time you would have a minimum of 16 hours flight instruction and, provided your progress is satisfactory, a flight-test. Theory instruction and tests are conducted in the mornings after flying. We will tailor the training we supply to your needs and simply charge hourly or per flight rates for the different components. 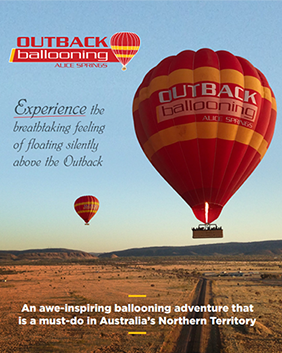 If we supply everything to do with training – balloon, instructor, crew, vehicle etc the cost to achieve a Private Pilot Certificate is about $A18,000 to $A22,000. Obviously if you already have some experience this cost is reduced. Accommodation is your responsibility. There are plenty of good, economical places to stay. We are happy to make recommendations and bookings. We generally have very reliable weather and a great training area. Conditions allow approximately 300 flying mornings per year. There are only 2 power lines and one sealed road. We lease the area we fly so there are no landowner relations issues. We fly in friendly controlled airspace, which allows for no pressure experience in radio procedures. There are 5 instructors on staff so availability is not a problem and you will benefit from a broader base of experience than is generally available to students. Progress is constantly reviewed by the Chief Flying Instructor. Most of our training is conducted between April & September. To get your Australian commercial licence requires a minimum of 75 hours flying experience plus 8 hours advanced training. We have a number of courses on offer, if you require further information, please don’t hesitate to contact us to discuss. Please let me know if we can help or answer any further questions. Find Out More About Pilot Training.